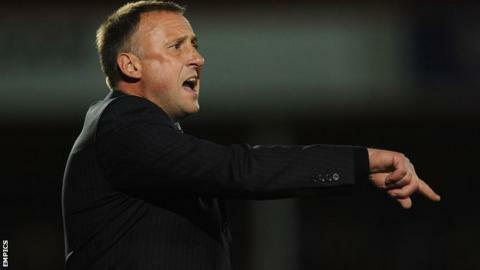 Cheltenham manager Mark Yates has missed out on a potential loan defender because of budget restrictions. Yates questioned his side's defending in their 4-2 Johnstone's Paint Trophy defeat by Oxford and signalled his intention to bring in a centre-back. Alan Bennett and Steve Elliott are Yates' trusted partnership at the back but Bennett is currently suspended. "I haven't been able to secure anything right now and I'm not sure I will," the Robins boss told BBC Gloucestershire. "I'm trying to get someone in but I'm not getting the right answers from my club and other clubs. "I wanted one particular player who is on a decent wage and they [the board] thought it was too much. "That's life and we've got to get on with it." Yates chose to utilise youngster Harry Hooman when captain Bennett was ruled out through injury at the start of the season. With Bennett serving the the first game of a three-match suspension for his sending off against Fleetwood, former Shrewsbury trainee Hooman was called upon again for the Oxford loss. But after their poor display, Yates has decided to send the 21-year-old out on loan to non-league Bath City to get more experience. "I've had a chat with Harry. I think he needs to go out and get a month's worth of games, where he's playing Saturday and Tuesday," Yates added. "I think he needs to take a step back a bit but I'll think he'll come again. "It means I have to go with what I've got and Keith Lowe will come in and I'm happy with that."